Chinese workers cut up pork at a processing plant in Luohe, China, in 2013. China has a national pork reserve, stashing away vast amounts of frozen meat in case of price inflation or war. Nathan Halverson takes us inside this major investigation of America’s pork industry. Smithfield Foods, producer of the iconic holiday ham, was one of America’s flagship food companies, steeped in centuries of U.S. tradition. The Virginia-based pork company derived its ham from a curing process Native Americans taught settlers five centuries ago. It owned part of Main Street in the bucolic town of Smithfield – including a restaurant, a historic Southern hotel and the company’s nearby headquarters. C. Larry Pope, its president and CEO, had a fireplace in his sprawling executive office, which looked more like a hunting lodge than the command center for what had become America’s largest pork business. 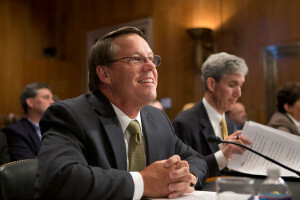 Smithfield Foods CEO Larry Pope prepares to testify before the U.S. Senate Committee on Agriculture, Nutrition and Forestry in July 2013. But in 2013, a Chinese firm bought this quintessential slice of Americana – Main Street and all. The takeover, valued at $7.1 billion, remains the largest-ever Chinese acquisition of an American company. Some xenophobia was to be expected. Anti-Chinese racism in America goes back nearly as far as, well, holiday ham. But behind the usual flag waving and Red Scare antics lies a stark new reality: Chinese companies, at the urging of their government, have launched a global buying spree, a new phase in their unprecedented economic experiment. And they’re targeting a resource that climate scientists, economists, the U.S. government, even Wall Street, all forecast will become dangerously scarce in the coming decades: food. Food is poised to become the oil of the 21st century, with scarcity and demand creating a situation ripe for wars, riots and uprisings. Food – namely crops such as soy, wheat and corn from which most other food products, such as pasta, bread and livestock meat, are derived – is in dwindling abundance as the world’s population grows ever larger, adding 220,000 mouths to feed every day. At the same time, global warming is destroying up to 2 percent of the world’s crop production every decade, according to the United Nations. “It is part of the transition from an age of surplus to one of scarcity,” Brown said. It’s a daunting prospect for those of us expecting to be alive in 2050, when the planet’s population is projected to reach at least 9 billion. Will we be able to feed everyone? Will politicians be capable of negotiating a global solution to vital food and water supplies? The Center for Investigative Reporting helped launch an initiative called Food for 9 Billion in 2011 that set out to answer some of these questions. As part of that effort, I spent nearly a year examining the Smithfield Foods takeover. What I learned goes far beyond pork. The world is set for a geopolitical struggle over food. The Chinese government already is dealing with looming food shortages within its own borders as tens of millions are eating more as they move from poverty into the middle class. The government is pushing Chinese businesses – both state-owned and privately held – to gobble up agricultural resources from around the world, including Africa, Europe and the United States. With the Smithfield purchase, a Chinese company now owns 1 in 4 pigs raised in the U.S. The question for U.S. lawmakers is: Did the Smithfield takeover represent business as usual for international commerce, or did it signal a concerted effort to control food supplies by one of the world’s most powerful governments? If the Chinese government was involved in the 2013 deal, some influential U.S. lawmakers say they need to take action to protect against foreign intervention in a vital U.S. resource. Pope, along with others who stood to benefit from the Smithfield deal, dismissed the Chinese government’s role in the takeover. The government does not control Shuanghui International or its acquisition of Smithfield Foods, they said at the time. This is simply one private company buying another. “Shuanghui is not a state-controlled company,” Pope said in the summer of 2013, when U.S. regulators still were reviewing the deal for national security risks. He testified to Congress that the Chinese government has no management control over Shuanghui. That, however, is not the case. 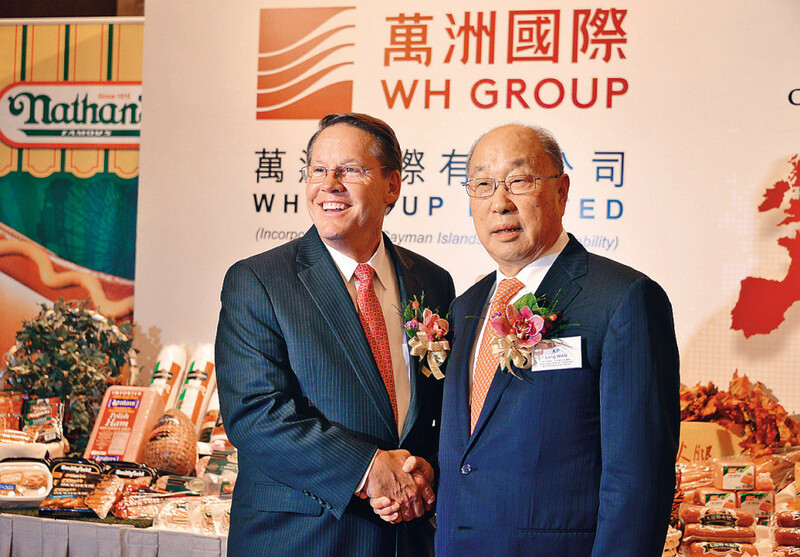 Larry Pope (left), president and CEO of Smithfield Foods, shakes hands with Wan Long, chairman and CEO of WH Group, formerly Shuanghui International, at a press conference in Hong Kong last year. The largest-ever Chinese acquisition of an American company began with an unexpected phone call in March 2013. Larry Pope sat in his office. An accountant by training, he’d spent the past 33 years climbing through the ranks of Smithfield Foods, the nation’s largest pork company and the largest employer in Smithfield, Virginia, a pastoral town of 8,200. Pope’s office overlooked a tranquil tributary of the James River, where the first settlers sailed and established Jamestown about 30 miles away. Scattered around his office were memorabilia signed by NASCAR legend Richard Petty, whom the company sponsored and whose car was emblazoned with the Smithfield logo. Pope had moved into the role of chief executive at Smithfield Foods seven years prior, taking the reins from the grandson of the company’s founder. He oversaw the company’s operations, including 46,000 worldwide employees, a research lab that had genetically engineered the leanest pigs on earth and nine slaughterhouses, including the world’s largest in North Carolina. The company processed 32 million pigs a year. On average, one pig moved through a Smithfield Foods processing plant every second to be slaughtered, butchered, packaged and shipped for consumption. Bacon, ribs and other pork cuts made Smithfield a multibillion-dollar company. Smithfield supplied restaurant chains such as McDonald’s and Denny’s and many grocery stores in the United States. It represented the height of America’s industrialized farming, owning everything from hog farms in Iowa to slaughterhouses outside Chicago and warehouses and distribution trucks that crisscrossed the United States, Canada and Europe. But Smithfield Foods was struggling. Its share price had fallen over the past five years. The company had gone through a series of layoffs. Major shareholders were getting restless. They wanted Pope to take drastic measures. The phone rang in Pope’s office. It was Russell Colaco, an investment banker with Morgan Stanley. Pope knew Colaco and his reputation as a big-time dealmaker. And Colaco knew Pope’s interest in buying a 20 percent stake in China’s largest meat company, Shuanghui International. Pope’s plan to expand Smithfield Foods – and fend off his anxious investors – included tapping into China’s booming consumer market. The Chinese already consume half of the world’s pork, and they are growing wealthier and hungrier for meat every year. In a single generation, China’s fast-growing wealth has transformed a nation of impoverished rice and noodle eaters into the world’s largest middle class, which can increasingly afford meat in its diet. But getting Smithfield pork into China wasn’t simply a matter of shipping it overseas. The Chinese government maintained strict restrictions on pork imports from the United States, including banning any meat containing a growth hormone commonly used by producers such as Smithfield. So Pope had negotiated – using a Chinese interpreter – with Shuanghui’s chairman, Wan Long. Wan had transformed a government-owned slaughterhouse, where he was appointed manager in 1984, into China’s largest meat company, eventually listing it on the Hong Kong stock exchange and becoming its largest individual shareholder. Pope proposed to Wan that they take a 20 percent stake in each other’s companies. Smithfield would gain a powerful ally in Wan, who is politically connected to China’s top leaders and also a member of the National People’s Congress. The partnership would be equal, reflecting the fact that although Smithfield Foods generated more than twice the revenue and was far more advanced in terms of global reach and pork technology than Shuanghui, growth rates in China were far higher. China had the consumers. America had the pigs. It was a match made in free-market heaven. Pope picked up the phone. Colaco cut straight to the deal. The Chinese were ready, he said. But it wasn’t a partnership they wanted. “What is it?” Pope asked. “Smithfield is not for sale,” Pope shot back. But then Pope equivocated. The shareholders were on his mind. Smithfield needed to boost sales. A potential fortune lay in China. “But I do like this discussion,” he finished. Both Pope and Colaco told me that they remembered the call as cordial and succinct. They hung up, agreeing to talk again. Pope, who had thought he could maneuver his way into the booming Chinese market, suddenly faced a takeover from the very place he had sought refuge. The Chinese didn’t want to save him. They wanted to buy him. Four months after that phone call, Larry Pope sat before the U.S. Senate Committee on Agriculture, Nutrition and Forestry. The deal had been publicly announced in May. Shuanghui had made an attractive offer – a 30 percent premium over Smithfield’s publicly traded share price. As CEO, Pope stood to earn at least $26.9 million in bonuses from the sale of America’s largest pork company. The U.S. Treasury Department was in the midst of reviewing the takeover for any national security risks. That review, by an obscure office within the department, was to remain classified per U.S. law. There were calls for a public hearing. U.S. Sen. Chuck Grassley from Iowa said he wanted to know whether the Chinese government controlled Shuanghui. Debbie Stabenow, the Michigan senator who headed the agriculture committee, wanted to know the same and called Pope to testify. It wasn’t mere curiosity. Two years earlier, the Chinese government had signaled its strong desire for overseas agriculture. It had unveiled its five-year plan, which amounts to the Communist Party’s roadmap for the country’s economy. A major focus of this plan: buying up overseas farmland and foreign food companies. The Smithfield deal included another $480 million in U.S. farmland, which would push the Chinese stake to nearly $1.4 billion in less than two years. Pope calmly addressed the senators in his measured Southern cadence. He assured them the Smithfield deal was simply the case of one private company buying another. He testified that the Chinese government had absolutely no management control in Shuanghui. Pope explained that the deal would create jobs in the U.S., not destroy them. Shuanghui’s plan to import more American pork would ramp up production at Smithfield’s 460 hog farms, creating more money for farmers and more jobs at the slaughterhouses. Stabenow pushed back. She wanted to know why Smithfield could not increase its sales to China as an American company and why only a takeover by a Chinese firm would open the doors to the world’s largest pork market. The Chinese government was unfairly blocking American hog farmers from exporting there, she said. If the situation were reversed, if Smithfield tried to buy Shuanghui, the Chinese government never would allow it, Stabenow concluded. Pope found a more sympathetic ear in U.S. Sen. Pat Roberts from Kansas, which is a key state for the production of livestock feed. American grain companies had supported the deal. In the past five years, China has become their biggest foreign customer. Laughter broke out in the hearing. Pope chuckled. “Senator, I did not,” he said. “And the control of your company somehow to allow China to control the pork industry?” Roberts asked, laughter erupting again. “Senator, I was not aware of that,” Pope responded, a smile spreading across his face. With Shuanghui International’s purchase of Smithfield Foods in 2013, a Chinese company now owns 1 in 4 pigs raised in the U.S. In 1984, the Chinese government appointed Wan Long head of a small, unprofitable slaughterhouse about 500 miles southwest of Beijing. He had grown up only a few kilometers away. It was in a region akin to Nebraska, covered in fertile soil and with an economy driven by agriculture. For Wan, who had served as a foot soldier in Mao Zedong’s army, the timing was great. China had begun opening its economy to Western business practices. Ambitious and entrepreneurial, Wan innovated and expanded the business. He released the first meat in China that carried a logo. To the Chinese, who were accustomed to viewing meat as an indistinguishable commodity produced by the government, this was something new. Shuanghui became the first trademarked meat in communist China in 1992. The same year that Americans were introduced to Crystal Pepsi, Wan was leading a commercial revolution in China simply by introducing a brand name. 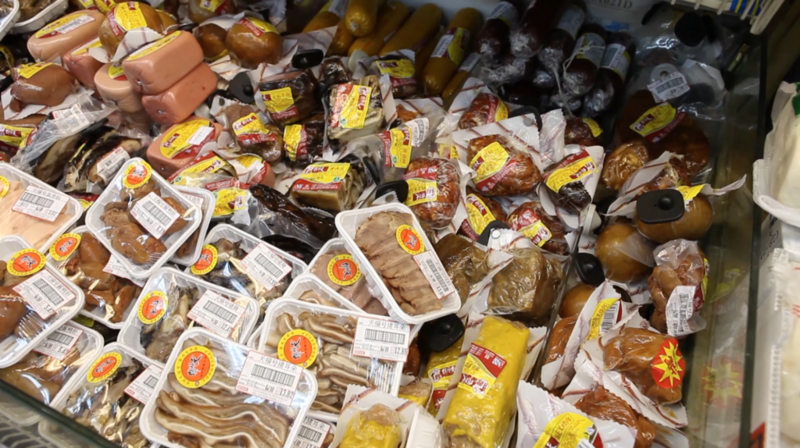 Shuanghui is now China’s largest meat company, and with the addition of Smithfield Foods, it has become the world’s largest producer of packaged meats, pumping out millions of tons of hot dogs and sausages every year. A year after the Senate hearing during which Pope testified, I traveled to Shuanghui’s headquarters in mainland China. I wanted to answer the question the senators couldn’t: Does the Chinese government have management control over Shuanghui? A few miles away, the company has built a more modern slaughterhouse set amid a sprawling, colorful campus that includes a distribution center, a food-grade chemical plant in partnership with DuPont and a processing operation that churns out brightly packaged meats of nearly every flavor and cut – from coconut sausages to smoked pig ears. The campus also has a massive refrigerated warehouse larger than a football field. It houses something found only in China: a national pork reserve. 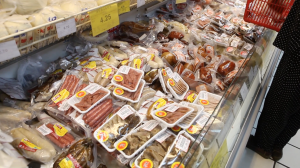 Much as the U.S. government maintains a strategic oil reserve, China stashes away vast amounts of frozen pork in case of price inflation or war. The mammoth warehouse I was staring at housed 110 million pounds. It is one of the many pork-reserve warehouses that Shuanghui operates for the government across China. Zhang Taixi, president of Shuanghui, walked me around the facility. Zhang is the top executive for the company’s Chinese operations. Effectively, he is Larry Pope’s counterpart in China. Both answer to Wan. Zhang proudly spoke of how fast the company had evolved in the past three decades under Wan’s leadership. Yet Zhang seemed almost dismissive of the recently built factories he was showing me. He said Smithfield’s processing equipment was three times faster. A sense of excitement, of anticipation, exuded from Zhang and other company employees I spoke with in the city of Luohe. The future was at hand. During my tour, I received a glossy company handout that served as an overview for plant visitors and included a translation in broken English. It described the company’s purchase of Smithfield Foods and how that would help modernize its facilities in China. It also stated something surprising. Shuanghui is required to adhere to Beijing’s five-year plan, the Communist Party’s national economic agenda. And the document was clear. Shuanghui meets its obligations and follows the path laid out by the Communist Party. Despite its public listing in Hong Kong, Shuanghui answers to the Chinese government – going beyond regulatory compliance. It receives directives from Beijing, and it follows them. The company’s candidness surprised me, especially because U.S. senators had been sparring over this exact topic a year earlier. Here was conclusive proof. Robert Wan, son of Chairman Wan Long, confirmed this relationship to me. We stood on the 76th floor of Hong Kong’s tallest building. We were in the company’s international headquarters, looking out floor-to-ceiling windows in his father’s corner office. It provided a million-dollar view of downtown Hong Kong through the thick July heat. Below us, air-conditioned ferries scurried across Victoria Harbour, shuttling people to mainland China from the former British colony. Like his father, Robert Wan was born in Henan province. But he had spent almost a decade living and studying in Canada. He spoke nearly flawless English. He kept his hair short and stylish and wore a pressed white button-down shirt with casual pants. Like others at the company, Robert Wan was kind, gracious and forthcoming during our meetings. I asked him about the company document. He broke it down for me. The Chinese government acts like a de facto board of directors for the country’s domestic industries – even for publicly traded companies like Shuanghui. The Communist Party issues the five-year plan, and Shuanghui is expected to follow that direction. The government can say it wants the Chinese meat industry to employ certain strategies, and all domestic companies are expected to adhere. Yet the day-to-day management of the company, how it chooses to carry out those directives, is left to the company’s management. And if there is no directive, the company is free to proceed as it views best. For modern Chinese companies like Shuanghui, which are largely focused on allocating their resources based on market conditions, it is a balancing act. “You have to maintain some distance from the Chinese government, but not too much distance,” Robert Wan said. This is a unique challenge for Chinese businesses, he added. But it is also an opportunity. The Chinese government owns a bank that provides the nation’s businesses with financing. For helping carry out the government’s agenda, Shuanghui received a $4 billion loan to take over Smithfield. The loan was approved in a single day. The Bank of China described the financing as its “social responsibility” and said it was carrying out the government’s plan to help domestic companies purchase overseas businesses, according to its 2013 annual report. “The Bank spares no efforts to support Chinese enterprises in their international competition,” it said. I asked Robert Wan why the government was so interested in Shuanghui’s business. “Pork is considered a national security issue in China,” he said. For more than eight years, Usha Haley has researched the Chinese impact on U.S. industries as a business professor at West Virginia University. And she said, based on her research, the Smithfield deal was likely China’s opening salvo to take control of the U.S. pork industry. In China, the line between government and private business is often thin, a result of the country’s unique blend of communism and capitalism. In the more than 30 years since China opened up and began barreling down a path that has transformed it into the world’s second-largest economy, American executives and policymakers have grappled with how to compete effectively with Chinese companies that benefit from high levels of government support. Until recently, this support has been geared toward protecting China’s domestic producers from foreign competitors. But as Chinese companies have matured, the scale of their ambitions – along with the government’s – has grown. They are entering a new phase of development, one that is taking them outside of China’s borders as they look to acquire companies and farmland overseas. I went to meet Haley in the town of Smithfield to discuss what her research could tell me about how the takeover would affect the town and its people. With its five-year plan in 2011, the Chinese government identified meat processing as a strategically important industry, and with the Smithfield purchase, the country gained access to the world’s most advanced animal rearing, slaughtering and meat processing and distribution technology, she said. Haley has testified before Congress several times on how China’s growth is damaging the U.S. economy. She is a fast, firm speaker, and once she gets on a roll, she can dominate a conversation. The Chinese will quickly import Smithfield’s technology to China, using it to increase their domestic production and establish massive processing plants to churn out sausages and deli cuts from animals raised around the world, she said. The United States increasingly will become a large hog farm for the Chinese, with refrigerated shipping containers transporting frozen pig carcasses to China, Haley said. The Chinese already consume half of the world’s pork, and they are growing wealthier and hungrier for meat every year. Haley has developed a theory on why China’s economic approach has been so damaging to other American industries and now poses a threat to the pork industry. The theory is a bit technical, which isn’t surprising for an academic. But here it is in its simplest form: Haley has found that China begins by importing the technological know-how and raw materials from the U.S. Then Chinese businesses use cheap labor to manufacture products for export back to the United States – offering lower prices in direct competition with established businesses in the U.S. This part of her theory is obviously not new. So what is it? Heavy subsidies from the Chinese government, she says. In the past decade, this is the destructive pattern China has developed to compete against other U.S. industries such as steel, paper and solar power, Haley said. Chinese businesses are able to undercut the prices of American producers and begin to control a larger and larger share of the market. Her research indicates Shuanghui has received $2 billion in subsidies from the Chinese government. China is now turning its sights on American agriculture. She laid out her prediction for China’s impact in about five breaths. China’s bold approach does not come without historic peril. The communist government’s plan to overhaul the countryside in the 1950s resulted in an estimated 37 million people starving to death and leaving another 200 million people close to death. Today, the event remains seared into the memories of China’s leaders, who understandably place great import on food security, Haley said. China and the U.S. are roughly the same size geographically – about 3.7 million square miles. But China has more than four times as many people to feed. And it has less arable land than the U.S. Rising meat consumption by China’s rapidly expanding middle class has made matters even more difficult for the government there. Meat requires far more farmland. It’s more efficient to feed grain directly to people in the form of noodles, bread and other products than to use it as feed for farm animals. It takes 7 pounds of grain to increase a cow’s weight by 1 pound in a feedlot or 3 1/2 pounds of grain to add 1 pound to a pig. Moving toward a meat-centric diet has put an incredible strain on China’s agriculture system. Simply put, Chinese farmers can no longer keep up. So China has turned to other countries to provide key commodities like the corn and soy used for livestock feed. This decade, China’s grain imports from the U.S. have skyrocketed – quickly making it the largest importer of U.S. agricultural products. Across the globe, China now buys 60 percent of the world’s soybean exports. Chinese officials only recently have recognized the futility of their long-cherished national goal of food self-sufficiency, said Fred Hu, former head of Goldman Sachs for greater China. With the five-year plan, Chinese officials announced a two-pronged approach to the nation’s food problem. They would rapidly modernize their antiquated domestic farming system, importing the factory farming pioneered in America by companies like Smithfield Foods. This would help China increase its domestic food production as it rapidly moves from backyard farming to industrial farming. The government also ordered its domestic food producers to scour the globe, buying foreign companies and agricultural resources that China could control in the coming decades, when other countries such as India and Nigeria are expected to encounter similar food challenges in the face of their own growing middle classes and a swelling global population. As is often the case in China, the government’s agricultural plan moved ahead with lightning speed. In 2013, Chinese companies were involved in a sixth of food-related deals globally, having never managed more than 2 percent in the preceding five years, according to a 2014 report by the Financial Times. 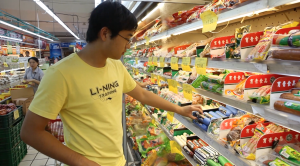 China is securing food supplies – increasingly, high-end food such as meat – for its middle class. To critics of China’s food grab, Hu says the Chinese still eat about half as much meat per capita as people living in the West. But the U.S. government needs to better protect who is controlling its vital resources, such as food, Haley said. In August, I met with Larry Pope in Smithfield, at the company’s headquarters along the Pagan River. By that time, Shuanghui had been rebranded as WH Group and publicly listed on the Hong Kong stock exchange. As part of the listing, Wan Long paid himself a $460 million bonus for accomplishing the Smithfield takeover. Wan, who remains a member of the National People’s Congress, transformed a government job into a personal fortune valued at more than $1 billion. I asked Pope, who is now an executive with WH Group, if he stuck by his testimony to Congress that the Chinese government has no management control over his new company. “I have never seen a government official related to this transaction from China at all,” he said. I told him about the Shuanghui company document and what Robert Wan had told me about the company’s adherence to the government’s five-year plan. He spent much of our conversation extolling the merits of the deal, how it would improve food safety and pork supply in China and create more American farm jobs. But for the first time, he publicly acknowledged the Chinese government’s five-year plan. Pope said Smithfield Foods now is transferring its technology to China, where American engineers are working with their Chinese counterparts to build a state-of-the-art food processing plant. It will be as advanced as anything in the United States, he added. And it is only the start. WH Group is spending a quarter of a billion dollars to have four of these facilities open within two years. It will process the meat in China and sell it under the Smithfield brand, according to the company. It also will use Smithfield technology to build three slaughterhouses and a large-scale farm that are expected to be finished in the next few years. The Chinese government has laid out a clear plan for its agriculture industry, and Pope is now part of it. I handed him the Bank of China document that stated the government’s financial support for the deal. “Wow” was the first word out of Pope’s mouth after he finished reading. I asked him if he could have gotten a similar $4 billion loan, in a single day, with backing from the U.S. government, to buy a foreign company and its technology. “No, I don’t think that’s doable in any industry that I can think of,” he said. He said it would be hard for American companies to compete with that, acknowledging that American competitiveness is at risk. This story was produced in partnership with the McGraw Center for Business Journalism at the CUNY Graduate School of Journalism. It was edited by Andrew Donohue and Robert Salladay and copy edited by Sheela Kamath and Nikki Frick. Nathan Halverson can be reached at nhalverson@revealnews.org. Follow him on Twitter: @eWords. Listen Nathan Halverson takes us inside this major investigation of America’s pork industry. Smithfield’s slump Larry Pope (left), president and CEO of Smithfield Foods, shakes hands with Wan Long, chairman and CEO of WH Group, formerly Shuanghui International, at a press conference in Hong Kong last year. 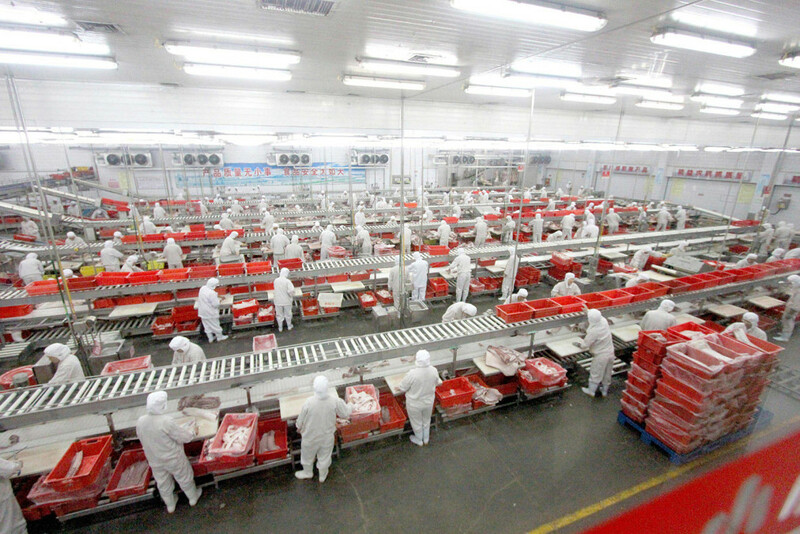 Humble beginnings With Shuanghui International’s purchase of Smithfield Foods in 2013, a Chinese company now owns 1 in 4 pigs raised in the U.S.
Rebranding and expansion Food is poised to become the oil of the 21st century, with scarcity and demand creating a situation ripe for wars, riots and uprisings.